The name, like the colour, leaves a certain ambiguity in its wake. While Midnight Blue happens to be the traditional alternative to black on tuxedo and tie occasions, the noblechairs ICON Series in Midnight Blue/Graphite draws its name from the colour of the night sky nearing the night of a full moon. This subtle shade of blue is then enhanced with top grain leather and precise, elegant graphite-grey stitching to leave a lasting impression. The suspension on a sports car directly contributes to the quality of the ride, similarly, the real-world performance of the ICON is determined by its ergonomics. The construction of the ICON series has necessitated an unrelenting level of precision engineering: 4D armrests, 90° to 135° of backrest adjustability, a robust 11° rocking mechanism and a safety class 4 gas lift supporting up to 150 kg coalesce to offer a superior sitting experience. While mechanical and material optimisations are key to the performance of the ICON, it is the shape in which they are employed that matters most. The eccentric shape of the ICON and its dimensionally stable cold foam improves ergonomic stability and anatomical compatibility, combining to maximise comfort and minimise pressure on the body over extended periods of use. To further customise neck and lumbar support we included two luxuriously embroidered and adjustable pillows, thereby enabling the seat to actively respond to the needs of the user. Consisting of dimensionally stable cold foam and covered in ergonomically shaped upholstery; the basis of noblechairs is a solid, supportive, steel frame. The foam’s density of 55% allows noblechairs to retain its shape after prolonged use as well as to support higher body weights. The open-cell foam is ergonomic, breathable and controls climate regulation as well. 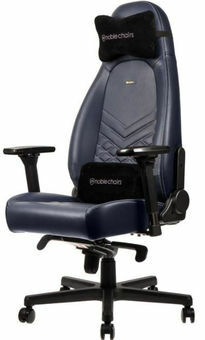 No mere gaming chair, the interplay of top grain leather and precision manufacturing is what drives the ICON forwards. That’s why we rely on supple and luxurious leather and an intelligent blend of perforation and diamond pattern stitching across the contact area to maximise comfort and breathability, allowing you to stay ahead of the competition without breaking a sweat.